You are here: Home » News » Congradulations! FOTMA exports XCMG XM200E cold milling machine to Africa! Congradulations! FOTMA exports XCMG XM200E cold milling machine to Africa! In this February ,Libya customer visited FOTMA and XCMG to discuss about the order of XCMG XM200E cold milling machine. In a beatiful day,Mr.Mohamed and Mr.Bilal arrived at city of Xuzhou.Firstly,they were accompanied to see the whole XCMG ground.The road rollers,motor graders,asphalt distributor vehiles are neatly arranged, like a soldier waiting for inspection.Then we went to visit the production line. Customers appreciate XCMG advanced and smooth production line. After three days negociation and evaluation,the customer highly proves FOTMA's sale spirit and XCMG XM200E cold milling machine quality.They signed the contract of XW200E cold milling machine immediately and send the funds the next day! In order to make customer delivery time request,XCMG and FOTMA cooperated closely to save every minute.Then the equipment was shipped out in 10 days.This is a three-win business for each party! XM200E cold milling machine's milling width is 2000mm and milling depth is 300mm.It adopts the best diesel engine manufacturer Weicha DHP12 engine! 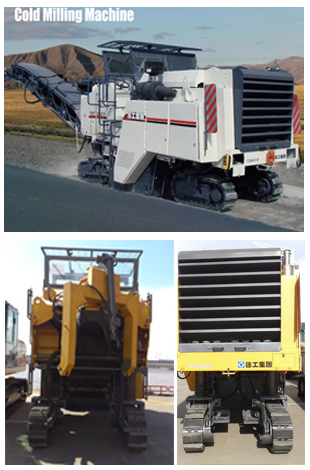 The engine rated power can reach 353kw,6 cylinder water cooled.Most of the main parts of XM200E cold milling adopt world top brand such as US SERVA clutch,STIEBEL transfer case,AOXING OR MOBA levelling system,SAUER hydraulic system,Rexroth dividing valve,STAUFF hydralic pipe&connections,HYDAC filter,BONFIGLIOL walking wheel side reducer ects. High quality parts and exquisite technology to ensure the high performance of milling machine. This is the most valued quality, but also the basis for cooperation. For more details,please click XM200E.